The first Spider-Man: Far From Home webs up multiple Easter eggs, including nods to Peter Parker’s (Tom Holland) late Uncle Ben and classic Spidey foes Sandman and Molten Man. Franchise newcomer Jake Gyllenhaal, who stars as the apparently heroic Mysterio, revealed at Brazil’s Comic Con Experience he’ll team with Spider-Man to battle the “Elementals,” creatures inspired by the classical elements of earth, fire, water, and air. The Marvel Comics depicted the little-seen Elementals as millenia-old superbeings who possessed mastery over the elements, including Hellfire (fire), Magnum (earth), Hydron (water), and Zephyr (air). “There are these threats to the world, the Elementals, elemental creatures. And Mysterio is someone who knows about them and wants to make sure that the world is safe from them,” Gyllenhaal said at CCXP, where he revealed Mysterio is working under Nick Fury (Samuel L. Jackson). The creatures spotted in the trailer bear resemblance to several Marvel Comics supervillains, including Sandman, Hydro-Man, Molten Man and potentially Cyclone, with Easter eggs suggesting the Elementals are updated spins on classic foes or knowing nods to the comic books. As Peter packs to join friends Ned (Jacob Batalon) and MJ (Zendaya) on a school trip to Europe, he stuffs a well-worn suitcase that once belonged to his late uncle, Ben Parker, who has yet to be seen in the Marvel Cinematic Universe. It’s Uncle Ben’s death that famously spurs Peter Parker into embracing his path as a superhero who must now live up to the adopted mantra of great power and great responsibility — a phrase first penned by Stan Lee as commentary in Amazing Fantasy #15 and later attributed in most iterations of the character as a phrase passed down by Peter’s sage uncle. 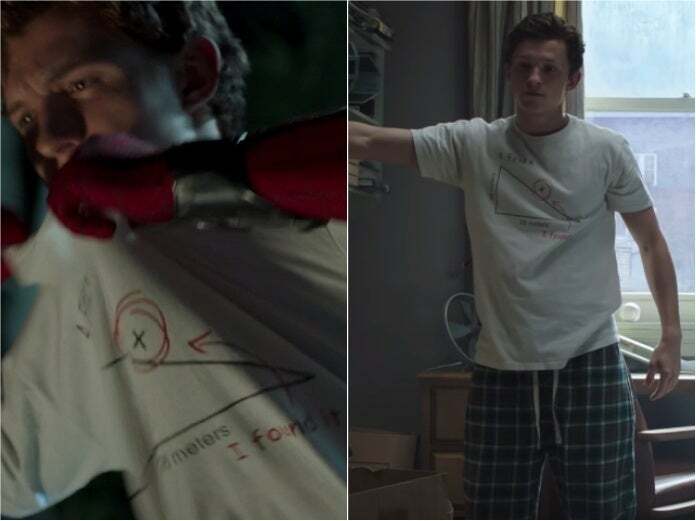 Peter first wore this graphic tee in 2017’s Spider-Man: Homecoming, wearing it underneath a button down when attending a party thrown by crush Liz (Laura Harrier). When readying himself to crash the party as a spotlight-stealing Spider-Man, Peter can be seen crouched on a roof and removing that same shirt before his superhero duties force him to abandon the party. When Peter picks up his passport from a post office, it reveals he was born August 10 — the same date Amazing Fantasy #15 swung into readers’ hands in 1962, bringing with it the first debut of the amazing Spider-Man. Amazing Fantasy was already due to be shuttered as result of failing sales, and the blockbuster success of comics’ newest sensation saw the masked man spun off into his own title, The Amazing Spider-Man, which saw the web-swinging crime-fighter emerge as Marvel Comics’ flagship superhero. While swinging around town, Spider-Man passes the now under construction former Avengers tower and the memorial carving erected in memory of the first responders present at the Battle of New York as seen in 2012’s The Avengers. When Peter makes a pit stop at the since rebuilt deli belonging to Mr. Delmar (Hemky Madera), behind-the-counter photos show a newspaper capturing the destruction that happened in Spider-Man: Homecoming, alongside photos showing Mr. Delmar posed with Spider-Man as well as former U.S. President Barack Obama. Obama is a noted comic book fan and once appeared on a special Inauguration Day variant cover of The Amazing Spider-Man #583 (January 2009). After Spider-Man and Aunt May (Marisa Tomei) participate in a fundraiser benefiting the homeless, Happy Hogan (Jon Favreau) — longtime chauffeur, once body guard and head of security for best friend Tony Stark (Robert Downey Jr.) — enters with a check for $500,000 signed by Stark Industries CEO Pepper Potts (Gwyneth Paltrow), who continues to handle the business side of Stark’s multi-billion dollar company. When Peter and friends are enjoying a gondola ride in Venice, their ride is interrupted by a stories-tall water monster resembling B-list Spider-Man foe Hydro-Man. A nearby boat, spotted behind Ned, reads “Asm 212,” or The Amazing Spider-Man #212 — the first appearance of Morris Bench, a small-time crook who came to possess the ability to transform his entire physical form into water, which he capitalized on by turning to a life of super-powered crime, often bringing him into conflict with Spider-Man. It is not yet known if the creature is intended to be Hydro-Man or if it is in reality Hydron, a member of a little-known Marvel Comics supervillain group known as the Elementals, one of which possesses mastery over the element of water. Fury and Maria Hill (Cobie Smulders) can be seen opening fire on a creature composed of Earth, who bears a significance resemblance to longtime Spider-Man enemy Sandman. Though this creature appears to be more rocky than sand — which could make him the Elemental known as Magnum, who commanded the power of Earth — a visible license plate directly in front of Fury reads “463.” The plate (4, ’63) could be a nod to 1963’s The Amazing Spider-Man #4: the first appearance of the villainous Sandman. The trailer finds MJ, Ned and Betty (Angourie Rice) fleeing from a fiery attack on the London Bridge, which appears to be under assault by a lava-like creature and potentially a wind-inducing cohort. Another license plate spotted next to MJ reads “2865 SEP,” pointing to the first appearance of Mark Raxton, a.k.a. Molten Man, in The Amazing Spider-Man #28 (dated September 1965). If the attackers aren’t Hellfire and Zephyr, signs point to Molten Man and Cyclone — a more obscure Spider-Man foe by the name of André Gerard, who used a specially designed suit to create dangerous high velocity winds that he used in criminal enterprises. Spider-Man first encountered Cyclone in the pages of The Amazing Spider-Man #143 — an issue that brought Parker overseas to Paris, France, where the superhero traveled to rescue Daily Bugle employers J. Jonah Jameson and Robbie Robertson from Cyclone’s demands for ransom. Spider-Man: Far From Home swings into theaters July 5.